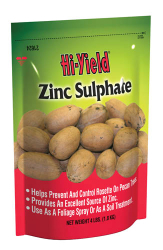 A dry formulation of zinc for application around fruit trees. Corrects deficiency that causes deformity of fruit, prevents and corrects Rosette on Pecans. Foliage spray: 1 tablespoon per 3 gallons. Soil treatment: 1-3/4 lbs. per inch of diameter.